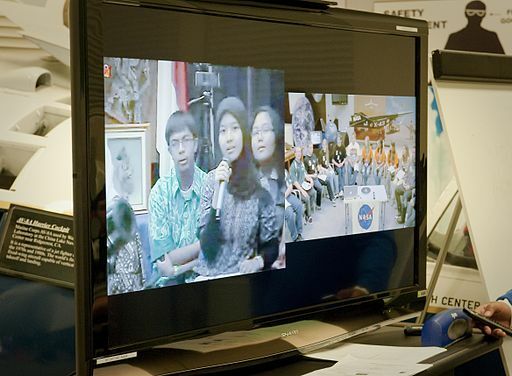 A dozen Indonesian students gathered at the U.S. Embassy in Jakarta (at left in the split-screen video monitor) had the opportunity to query their American high school counterparts on their interests, experiences and culture during the interactive video link-up recently at NASA Dryden's Aerospace Exploration Gallery in Palmdale, Calif. Photo c/o NASA. May 12, 2019. Wiki Commons. Used with permission. Stock Report Card. (c) Natalie Pace 2019. All rights reserved. Zoom has many strengths. The company is the best-in-class. It is achieving viral marketing of its video conferencing by offering free conferences to everyone (with limited time and number of attendees). Many of those freebies, and the friends they invite in, are becoming paid subscribers. The company is also profitable, bringing in $7.6 million in net income for fiscal year 2019. Revenue doubled year over year (up 118%), to $330.5 million. Zoom was named #2 Best Company to work for by Glassdoor in 2019, and Eric S. Yuan, Zoom’s CEO has been racking up the awards for his leadership. However, there is an issue with the board. It’s overweighted with finance people, and underweighted with technology leaders, government relations specialists, product visionaries and marketing geniuses. So, whereas Google was finding ways to diversify its revenue stream under the experienced guidance of Eric Schmidt, it appears that Zoom is focused mainly on subscriptions. This will be a problem if the economy weakens, and individuals find that basic expenses outweigh their desire to convene. Also, when you get too many finance people in the room, there can be too much focus on monetization, and not enough on innovation. The worst example of this was the Sears Holding Co. board. So far, Zoom is doing everything right. However, Microsoft is likely to awaken and want to make Skype more competitive, and this is where the technology and government relations oversight can be key. "Unicorn" by Gustave Moreau 1885. Public domain. Wiki Commons. Used with permission. Zoom shares are expected to hit the NASDAQ stock exchange this week, with trading to start at $28-$32/share. According to Business Insider, at the high end, that would make Zoom Video Conferencing (symbol: ZM) valued at $8.25 billion. So, here’s another unicorn that might be worth more to look at (or to use) than to own, at this time and price. By looking behind the splashy painting, and into the fine print of the numbers, you, too, can identify the Unicorn IPOs from the Zombies. It's no accident that my track record on these IPOs is so high. (Lyft and Snap weren't the only IPOs I said to avoid. Google wasn't the only one I touted on television.) 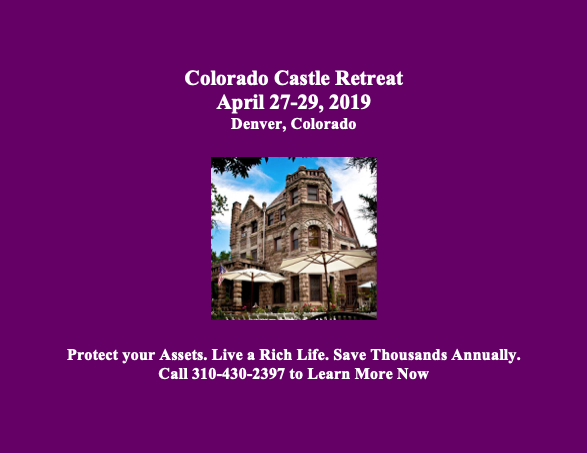 If you'd like to learn these strategies firsthand, join me at my Colorado Investor Educational Retreat this April 27-29, 2019. I'll also be hosting a Real Estate Master Class the day before (April 26, 2019). Click on the flyer links below for additional information, including the 15+ things you'll learn and VIP testimonials. Call 310-430-2397 to learn more and to register now. Learn the ABCs of Money that we all should have received in high school in this intimate, 3-day, boardroom Investor Educational Retreat. Protect your assets. Earn money while you sleep. Learn to save thousands annually with smarter big ticket choices. Join Natalie Pace for a Put Your Money Where Your Heart Is & Profit Conference in Loveland, Colorado on April 18, 2019. Click to learn more. 10 Rally Killers. Fix the Roof While the Sun is Shining. Uber vs. Lyft. Which IPO Will Drive Returns? Boeing Cuts 737 Production by 20%. Tesla Delivery Data Disappoints. Stock Tanks. Why Did Wells Fargo's CEO Get the Boot? Earth Gratitude This Earth Day. Real Estate is Back to an All-Time High. Is the Spring Rally Over? The Lyft IPO Hits Wall Street. Should you take a ride? Cannabis Doubles. Did you miss the party? Drowning in Debt? Get Solutions. The Debt Ceiling Was Hit (Again) on March 1, 2019. How Bad Will the GDP Report Be? The High Cost of Free Advice. Apple's Real Problem in China: Huawei. 2018 is the Worst December Ever. Will the Feds Raise Interest Rates? Should They? Learn what you're not being told in the MSM. Why FANG, Banks and Your Value Funds Are in Trouble. When the Santa Rally is a Loser, the Next Year is a Bigger Loser. OPEC and Russia Cut Oil Production. Trade Deficit Hits an All-Time High. Wall Street Plunges 800 Points. How to Protect Yourself. ​Rebalance and Get Safe in December. Here's Why. The Best Investment Decision I Ever Made. What's Safe for Your Cash? FDIC? SIPC? Money Markets? Under the Mattress? The Real Reason Stocks Fell 602 Points on Veterans Day 2018. Will Ford Bonds Be Downgraded to Junk? 6 Risky Investments. 12 Red Flags. 1 Easy Way to Know Whom to Trust With Your Money. Whom Can You Trust? Trust Results. October Wipes Out 2018 Gains. Will There Be a Santa Rally in 2018? The Dow Dropped 832 Points. What Happened? ​Bonds are In Trouble. Learn 5 Ways to Protect Yourself. Interest Rates Projected to Double by 2020. 5 Warning Signs of a Recession. Fix the Roof While the Sun is Shining. The sun breaking through storm clouds over the Hudson River in Manhattan (NYC). August 21, 2017. Photo by Natalie Pace. Wiki Commons. You may use if you include my name as the photographer. Please link back to NataliePace.com. The 10 Events That Will Drive (or Tank) the Economy in 2019. John F. Kennedy Jr. famously said, “The time to fix the roof is while the sun is shining.” As we enter the 11th year of this recovery, it is definitely time to do a full assessment of our roof, testing where the vulnerabilities lie and fixing them now. Most Americans are going to need an outside opinion for this. Why? Would you hire the roof contractor who let the storm flood your home last time? If you lost more than 30% in the Great Recession and you haven’t made any changes to your plan, then now is the time to get an unbiased, second opinion. And here’s why. There are at least 10 areas of economic vulnerability – many which are not in the headlines yet – that make 2019 a rather precarious year for stocks and bonds. The Debt Ceiling Was Hit on March 1, 2019. Will the U.S. Keep AAA Rating with Fitch Ratings? China/U.S./EU Trade War & Tariffs. Flat or Inverted Yield Curve. Escalating Public Debt (and debt of every nature really). Policy Impotence in the 11th year of the Bull Market. And here are the facts on each point. GDP growth in 2018 was 2.9%. 2019 GDP growth is predicted to slide down to 2.1%, with the 1st quarter 2019 GDP growth to fall somewhere between 1.4-2.3% (potentially under 4Q 2018’s disappointing 2.2% growth). The 1Q 2019 GDP growth report will be released on April 26, 2019. Investors aren’t fond of low GDP numbers. 2. The Debt Ceiling Was Hit on March 1, 2019. The debt limit was hit (again) on March 1, 2019. Most Americans aren’t aware of this, and it was under-reported in the mainstream media. Trying to locate a copy of the letter that Treasury Secretary Mnuchin send to Nancy Pelosi is next to impossible. (Click on Mnuchin to access.) The U.S. public debt is now at $22 trillion. Add in consumer debt, corporate debt and loans and municipal and state debt, and that number skyrockets to over $72 trillion. The U.S. must raise the debt ceiling before it runs out of money to pay its bills, which is predicted to be around September 30, 2019, give or take a few weeks (source: CBO.gov). If the debt limit is not raised before that X date, the U.S. risks a credit downgrade. Wonder who owns all of this debt? You do! Click to read my blog outlining the foreign and domestic holders of the U.S. debt. FYI: Russia sold off almost all of their U.S. treasuries in April of 2018 and has been stockpiling gold. 3. Will the U.S. Keep AAA Rating with Fitch Ratings? During the last Debt Ceiling crisis in 2017, Fitch Ratings warned, “If the debt limit is not raised in a timely manner prior to the so-called “x date” Fitch would review the US sovereign rating, with potentially negative implications.” This possibility was reiterated by Charles Seville, a senior director at Fitch, in January of 2019, during the government shutdown. Both Fitch and Moody’s expect the Debt Ceiling to be raised before the Treasury runs out of money, which is predicted to be sometime in August. (Last time, the White House made a deal with the Democrats, against their own party, to raise the Debt Limit.) In that event, the Debt Limit won’t generate a downgrade, but is a reminder of the unsustainable path of debt that the U.S. is currently teetering on. If X date is hit without a deal, both agencies will likely review the U.S. AAA credit. Fitch is more likely to downgrade than Moody’s. 4. Putin/bin Salman Oil Partnership. There is a very high correlation between oil prices and recessions. 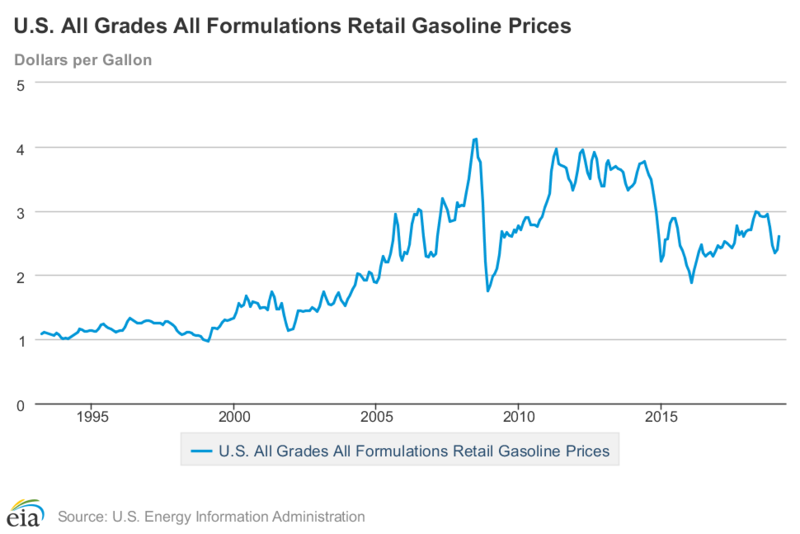 So, the lower prices of gasoline and other petroleum products over the last few years have been helpful to economic growth by giving consumers a little room in their budget for other spending. However, on December 7, 2018, Putin and Saudi Arabia Prince Mohammed bin Salman (the one accused of killing journalist Jamal Khashoggi) agreed to cut oil production. This is intended to increase the price of oil. If it works, this will be a drag on the economy. 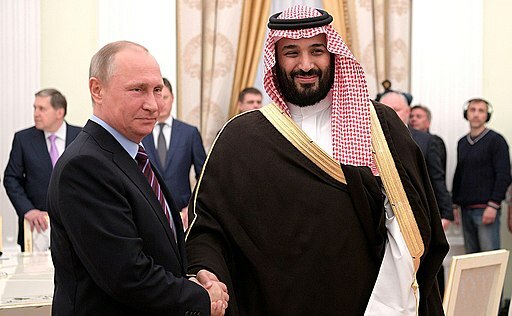 Vladimir Putin with Deputy Crown Prince and Defence Minister of Saudi Arabia Mohammad bin Salman Al Saud. May 30, 2017. Photo by The Kremlin. Wiki Commons. Used with permission. 5. China/U.S./EU Trade War & Tariffs. Tariffs hurt economies. Currently, the U.S. government is imposing tariffs on China and has threatened to impose them on Canada and Europe. The auto manufacturing and solar industries have suffered a dramatic increase in the cost of their parts. Farmers have suffered. And the U.S. trade deficit has skyrocketed to heights never seen before. Low interest rates create bubbles. 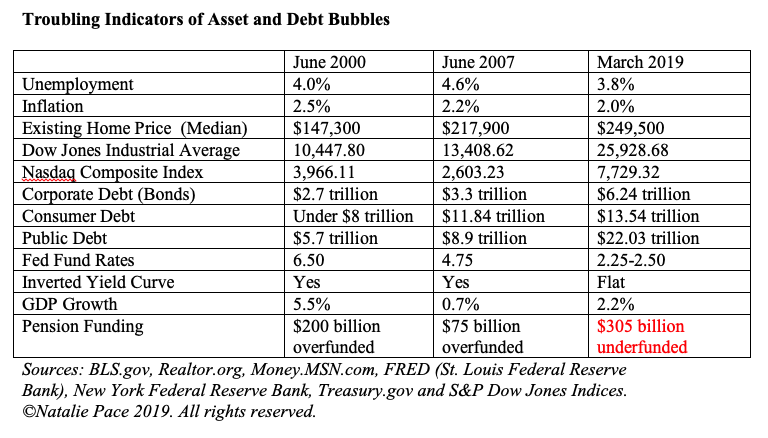 Check out the Asset Bubble Chart below. Low interest rates will also create a massive problem for the Federal Reserve during the next recession. As former Secretary of the Treasury Lawrence H. Summers explains it, “Interest rates are reduced by 5 percentage points to combat recessions” Therefore, in the next recession, we risk “policy impotence” because there just isn’t enough room to lower rates enough to goose growth. Summers doubts that quantitative easing alone can do the trick. 7. Flat or Inverted Yield Curve. An inverted yield curve is 100% associated with recessions for the last half a century. Part of the reason for that, as Liz Ann Sonders, the chief investment strategist for Charles Schwab explains, is that having the short-term rate (the rate at which banks borrow) and the long-term rate (the rate at which banks can lend) be inverted means that banks lose money. So, financials are out of favor at this time, too, from an earnings perspective. However, the banks are buying back their own stock at records not seen since pre-Great Recession. According to Howard Silverblatt, the senior index analyst at S&P Dow Jones Indices, Wells Fargo spent $29.153 billion on buybacks and dividends in 2018, which is $8.46 billion more than the company earned (at $20.69 billion). 8. Escalating Public Debt (and debt of every nature really). 10. Policy Impotence in the 11th year of the Bull Market. Despite ample evidence that 5% Fed Fund rate is the basis needed before a recession, and growing evidence that inflation above 2% would actually be healthier for the economy, the Administration keeps Tweeting for lower interest rates. In the short run, that might make the economy look stronger than it is (something that all politicians like to brag about, regardless of which side of the aisle they sit), by promoting more asset bubbles. Additionally, we see 1% GDP growth for every 10% increase in stock prices (according to Alan Greenspan in his April 12, 2019 interview). In the long run, lowering interest rates prematurely would be a devastating move, causing policy impotence to help make the “landing” of a correction/recession “softer.” In the 11th year of a bull market, during a global economic slowdown, this risk becomes increasingly pronounced. Learning how much you have at risk, and how safe and diversified you currently are, from a qualified, independent, unbiased source, could protect you from another financial catastrophe, such as occurred in 2008 and 2000. As you can see from the 10 points above, the economy in 2019 is far more precarious than it was in 2000 or 2008. Real estate prices are higher, stock prices are higher, bonds are in a bubble, the trade deficit is higher and debt is absolutely astronomical. Wisdom and time-proven strategies are the cure. ​The economic landscape can change rapidly. Time proven systems will be your ally. Join me at my Colorado Investor Edu Retreat, where we’ll examine how to protect your assets, learn what's safe in a world where stocks and bonds are in a bubble and invest profitably in high growth opportunities (like cannabis). Call 310-430-2397 or email info @ NataliePace.com to learn more about the retreat, or to request an unbiased second opinion on your current budgeting and investing plan! Real Estate Master Class. April 26, 2019. A home is one of the biggest purchase you will ever make. It pays to get it right, and can ruin your life for years if you don't. Receive $100 off the price of the Master Class when you register for the Colorado Investor Educational Retreat, too. Call 310-430-2397 or email info @ NataliePace.com to learn more. oin Natalie Pace for a Put Your Money Where Your Heart Is & Profit Conference in Loveland, Colorado on April 18, 2019. Click to learn more. To date, LYFT investors have suffered losses of almost 35%. As many late-cycle IPOs tend to be – the LYFT IPO was important as a liquidity event for insiders, even though it has cost investors who are new on the scene. Founders and venture capitalists can only hold paper money for so long before they want to turn it into a home or jet or something. This is what I warned about two weeks prior to the Lyft IPO. Click to see that blog. So, is Uber driving along the same road? On the face of it, Uber would appear to be a better investment. The company’s board is made of veteran global VIPs who know how to navigate sensitive government relations – something that is critical to the future of Uber, Lyft and ride-share in general, as the business premise itself is being challenged in many countries on many fronts. One of the fundamental challenges that ride-share faces is the classification of the drivers as independent contractors. Many European countries believe that drivers are employees the minute they turn on the ride-share app. Uber argues that they are a technology company that enables individuals to make a little dough on the side. That argument lost in England (Uber is appealing to the Supreme Court), in Switzerland and has run into tax problems in The Netherlands. At stake are mountains of expenses, including taxes, benefits and driver expense reimbursement. If drivers worldwide were classified as employees, it’s hard to imagine Uber or Lyft surviving. Since ride-share is so popular with people, it’s also hard to imagine countries wanting to kill this movement. Lyft will benefit from Uber’s ability to trail blaze through the red tape, while keeping their business model in tact. Uber’s independent chairman Dr. Ronald Sugar, the former chairman and CEO of Northrop Grumann, is no stranger to getting governments on board with his vision. To assist him, Uber has also stacked the board with other global CEOs, including Wan Ling Martello, the former CEO of Nestle AOA (Asia, Oceana and Africa) who is also an Alibaba boardmember, John Thain (former CEO of Merrill Lynch, during the makeover) and H.E. Yasir Al-Rumayyan, the manager of the sovereign wealth fund of Saudi Arabia. By the numbers and with such a very strong executive and board team, Uber buries Lyft in potential. (Lyft has a strong board, but is still run by its co-founders.) Uber is expected to come in with a $100-$120 billion valuation. Lyft’s value has dropped to under $20 billion. Uber was profitable in 2018, with $997 million in net income, whereas Lyft lost almost a billion ($911.4 million). Uber’s 2018 revenue was $11.3 billion, compared to Lyft’s $2.2 billion. However, Lyft benefitted greatly from Uber’s brand crisis in 2017, when former CEO Travis Kalanick, along with other executives and board members, were accused of basically being trogolodytes, stuck in the Stone Age with regard to their attitudes toward women. In 2018, while Uber scrambled to replace the executives under attack, including Kalanick, Lyft’s revenue more than doubled. Given the negative headlines that tarnished Uber’s brand, the company posted strong growth of 43%. Uber leapt into action to turn the ethos and culture around. Uber’s board now boasts of 3 women and 5 board members of color (including CEO Dara Khosrowshahi, who is Iranian). Mr. Khosrowshahi is a very respected CEO, formerly of Expedia, who is an M&A and growth master. Perhaps the strongest indicator that the brand has recovered is that we’re still “Uber-ing it” instead of Lyft-ing or catching a cab. Uber still has Kalanick and a few of his cronies on the board. However, the overall trend-line is that Uber is aimed at becoming the next blue chip – a worldwide brand with a vision and product pipeline that is transforming transportation and will be leading innovation for the next half century. So, should you buy into the Uber IPO? At some point, you will definitely want to be an Uber shareholder. However, any IPO in the 11th year of a late-stage business cycle risks rewarding insiders at the expense of the new investors. 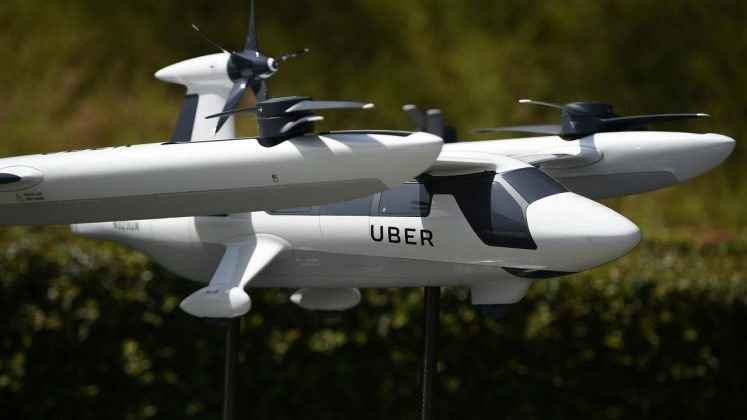 Uber’s potential spans the stars and includes autonomous vehicles and even flying cars. However, as with any rewarding investment, it’s important to purchase your shares at a great price. Should a company with $11.3 billion in revenue carry a value of $120 billion – on par with Nvidia and Paypal? Or is the whole lot overpriced? Alan Greenspan, Warren Buffett, Robert Shiller and multiple other economists have been warning for over a year that stocks are in a bubble. We might have grown numb to astronomical P/E ratios. However, the markets tend to humble those who ignore valuations in favor of hype. For my money, I’ll catch a ride with Uber after the insiders cash in their shares and the pricing is more on my side. Uber filed its S-1 yesterday and has launched its roadshow. Shares should be publicly available sometime over the next two weeks. Many, but not all, of Uber’s insiders have a 180-day lockup period. The economic landscape can change rapidly. Time proven systems will be your ally. Join me at my Colorado Investor Edu Retreat, where we’ll examine how to protect your assets, learn what's safe in a world where stocks and bonds are in a bubble and invest profitably in high growth opportunities (like cannabis). Call 310-430-2397 or email info @ NataliePace.com to learn more about the retreat, or to request an unbiased second opinion on your current budgeting and investing plan! Boeing Cuts 737 Production By 20%. The Stock is Down 16%. As might be expected, investors responded by selling off the stock in after-hours trading on Friday, continuing the sell-off today. The stock is trading at $374.61, down 16% from the all-time high of $446.01 on March 1, 2019. The all-time high occurred just 10 days before the Ethiopian Airlines fatal (and heartbreaking) crash on March 10, 2019. Since then, more and more bad news for Boeing has unfolded. But the stock has stayed fairly resilient. How’s that the case? In short, buybacks. The 737 production is not the only thing that Boeing will have to cut. Boeing has one of the biggest buyback programs on Wall Street. On the Boeing investor’s home page, the company boasts that it has given out $50 billion over the last five years in buybacks and dividends. The problem with excessive spending on buybacks and dividends is that, at least in 2018, the amount given back was more than the company made. In other words, like many dividend-paying, debt-laden Blue Chips, Boeing has been using buybacks to prop up their own stock, which makes their earnings look stronger than they really are, and lowers the price-to-earnings ratio (by reducing the share count). In 2018, Boeing repurchased $9.3 billion in shares and paid out $4.6 billion in dividends, for a total cost to the company of $13.9 billion. Since the net income of 2018 was only $10.45 billion, Boeing paid out $3.45 billion more than it earned. At the end of 2018, Boeing’s cash was down to just $7.6 billion, from $11.7 billion in 2014. That’s flying a little too close to the trees, considering the production cutback. So, it’s likely that Boeing will be borrowing as quickly as possible. That would trigger a rating for the debt issuance, which will be negatively impacted from the production cut and the grounding of Boeing’s largest revenue generator, the 737. This doesn’t mean an automatic downgrade, but it will be included in the analysis. The 737 accounted for 70% of the planes delivered in 2018, at 580 out of 806. The company may wish to postpone raising debt until they get the all-clear on delivering the 737 again. In this scenario, they may have to preserve capital and postpone share repurchases, allowing the stock to trade freely on investors’ whims. 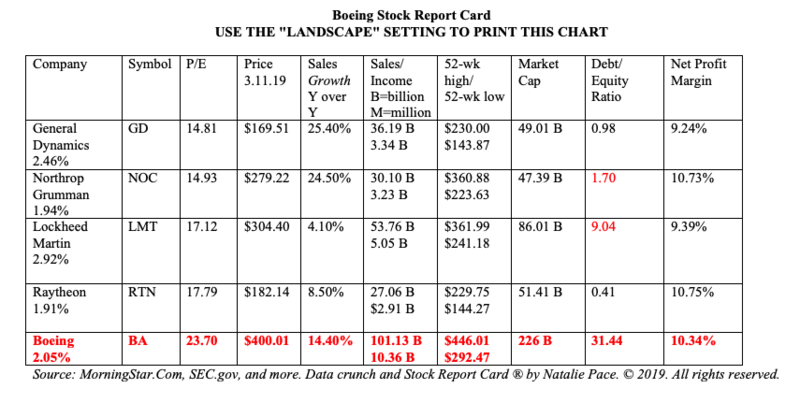 As you can see from the attached Stock Report Card, Boeing already has an astronomical debt/equity ratio and the highest price to earnings ratio of its peers. 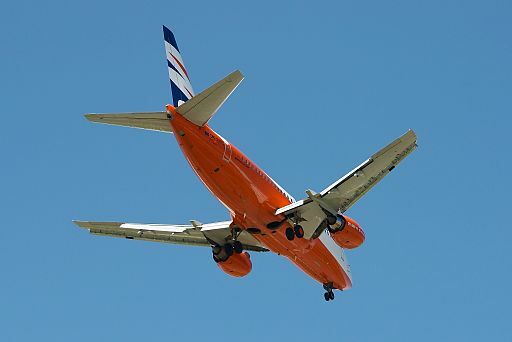 So, given the amount of debt that Boeing already has, combined with all of the lawsuits over the plane crashes and a worldwide grounding of the 737, Boeing may find their loan or bond covenants with strings attached – such as the money can’t be spent on buybacks or dividends. The last company to make headlines for paying out more in buybacks and dividends than it earned in income was General Electric. General Electric’s dividend has been slashed to 4 cents, and the share price has dropped by more than 70% from where it was in 2017. ​Boeing’s capital situation, and a pause in the company’s share repurchases, could affect the share price as much or more than the 20% reduction in 737 production. Boeing is authorized to repurchase up to $20 billion of its own stock. However, the math doesn’t add up on executing that at this time. Boeing executives and staff will be working around the clock to get the software fixes needed to get the 737 back in the skies as quickly as possible. Boeing is a stalwart brand (until these latest tragedies) with products that are very much needed in today’s world. There are a slew of government insiders on the Boeing board to help facilitate a fast approval once the 737 is ready to fly. However, whenever that occurs, which could be within a few short months, the prudent investor will be looking at the balance sheet to determine whether or not that 2.10% dividend is worth gambling your principal on at this time. The production slowdown will impact earnings for at least a few quarters going forward. Boeing is not the only debt-laden blue chip that is spending a lot more propping up its stock and paying out dividends than it is earning in net income. Stay tuned to my blog at NataliePace.com/Blog for a more complete report later this week. As the economic landscape changes rapidly, time proven systems will be your ally. Join me at my Colorado Investor Edu Retreat, where we’ll examine how to protect your assets, learn what's safe in a world where stocks and bonds are in a bubble and invest profitably in high growth opportunities (like cannabis). Call 310-430-2397 or email info @ NataliePace.com to learn more about the retreat, or to request an unbiased second opinion on your current budgeting and investing plan! On April 3, 2019, Tesla issued a press release on their first quarter 2019 vehicle delivery count. At 63,000, it was down 31% from the deliveries in the 4th quarter of 2018 (90,700). Production was also lower, at 77,100 vs. 86,555 respectively. That combined with the SEC’s full-court press on Elon Musk’s Tweets sparked a sell-off of Tesla stock, bringing the share price down near its 52-week low. Should You Buy, Sell, Hold or Avoid Tesla Stock? When considering whether to buy, sell, hold or avoid any individual stock, evaluate what the company is doing going forward, evaluate what the state of the industry is, and then factor in what the macro economy is doing. 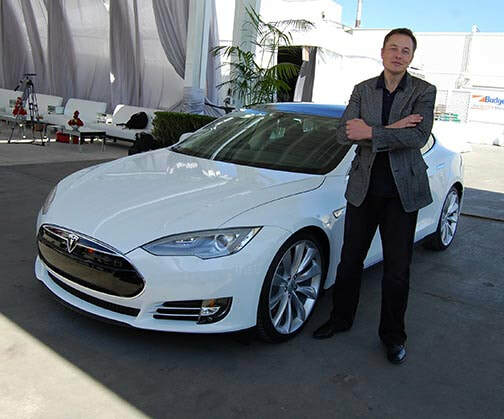 Take your profits early and often when a company is highly volatile (like Tesla). Think Capture Gains, Not Stop Losses. Make sure to apply the 3-Ingredient Recipe for Cooking Up Profits. Below is additional information on each point. What is Tesla’s Outlook for 2019? Additionally, Tesla’s Shanghai Gigafactory is projected to be up and running in 2019, by year’s end. In the 4th quarter of 2018, Tesla was cash positive, generating $139 million in net income. The 1st quarter 2019 could experience a net loss, due to the lower deliverables and a one-time restructuring charge. A 30% drop in auto revenue (based upon the same percentage drop in deliverables) would result in revenue in the $5.330 billion range. A massive pullback in revenue, and a revert back to cash negative operations, will not be welcome news to investors, when the actual numbers are confirmed in the 1st quarter 2019 earnings report, around May 7, 2019. Full-year 2019 is predicted to be cash-positive for Tesla, with a “25% Model 3 non-GAAP gross margin at some point in 2019,” according to the January 1, 2019 letter to shareholders. Auto Stock Report Card April 3, 2019. (c) Natalie Pace 2019. All rights reserved. Tesla is the clear winner in the industry in terms of outstanding sales growth. This trend could accelerate with oil prices on the rise. (Click to read my oil blog.) In 2018, there was a surge in the sales of trucks, which accounted for 70% of dealership sales (source: National Automobile Dealers Association). A decade ago, 52% of the market was cars, with 48% light trucks. NADA Chairman Wes Lutz explained the trend, writing, “One of the main factors for this shift has been continued low oil and gasoline prices and the fact that crossover utility vehicles are nearly as fuel efficient as their sedan counterparts.” This has caused Ford and GM to all but abandon their sedans and lean heavily into their trucks. Meanwhile, the Tesla 3 sedan was yet again the best-selling mid-sized premium sedan, selling 60% more units than the runner up. ​The auto industry is expected to have 16.8 million new vehicle sales in 2019. As consumers continue to understand just how reliable and fun Tesla vehicles are, and how much cheaper it is to fuel an electric car vs. a gas guzzler, the trend might shift toward Tesla, just as it did to the Prius in 2004, when oil prices began to rise. Even now, with gas prices still relatively low at $2.59/gallon on average, the fuel savings of owning a battery electric vehicle (BEV) can be half or more over gas-powered vehicles (source: University of Michigan). The global economy, including the U.S. economy, is predicted to slow down in 2019. 2018 saw GDP growth of 2.9%. 2019 GDP growth is predicted to slow to 2.1%. The Federal Reserve Bank of New York forecasts that the 1st quarter of 2019 growth may stall out to just 1.4% growth, with 1.9% growth in the second quarter of 2019. The Elon Musk Hearing. What About That Tweet? Clearly the SEC is making a full-court press on Musk – something that seemed apparent to Judge Alison Nathan. “Put your reasonableness pants on,” she advised both parties on April 4, 2019 at the hearing where the SEC had hoped to hold Musk in contempt of their previous settlement. What’s at the heart of the renewed SEC attack on Musk? 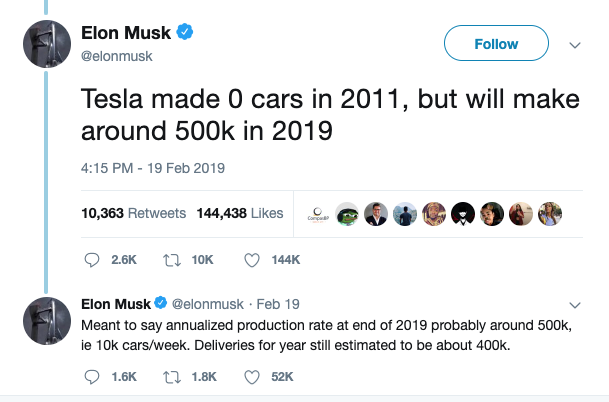 A tweet he sent out saying that production would be at 500,000 autos by year’s end. The judge gave both parties two weeks to come up with a reasonable settlement. This is clearly not the decisive victory that the SEC wanted. While not a win for Musk either, it was at least not another nightmare. Investors were relieved by the news. Tesla stock is up 2.7% today. When you are on a rollercoaster with as many ups as downs, if you set stop losses, you are losing every time the market pulls back, which is often. This is a losing formula. If you set capture gains, you are winning every time the market rises, which is just as often as the pullbacks! This is a winning formula. Take your profits early and often this late in the business cycle. If it’s a rock star industry, like cannabis, you might keep some skin in the game in case the stock goes to the moon. However, for most companies and industries, there is more downside potential than upside. With stocks at an all-time high, and price-to-earnings ratios higher than ever, there aren’t many bargains to be had. So, it’s better to err on the side of liquidity, which allows you to buy low on weakness, rather than worry about missing a market rally party, which might be almost over. ​Apply the 3-Ingredient Recipe for Cooking Up Profits ®. Start with what you know and love. Learn more about my 3-Ingredient Recipe for Cooking Up Profits in my first book Put Your Money Where Your Heart Is (aka You vs. Wall Street in paperback). So, Should You Buy, Sell, Hold or Avoid Tesla Stock? The Tesla 1Q 2019 earnings report is likely to be ugly. That will be issued around May 7, 2019. The 2nd quarter 2019 earnings report will benefit from the 10,600 vehicles that Tesla had in transit at the end of the first quarter. At the low end of Tesla’s forecasts, deliveries for the remaining three quarters of 2019 would be 99,000 on average (with the 4th quarter on track for 500,000 annualized, at 125,000/quarter). After the first quarter miss and weakness, that would be a pleasant surprise for investors. So, the Fourth of July deliverables report from Tesla could spark fireworks. In short, if there is continued weakness in the Tesla share price, particularly after the earnings report around May 7ish, 2019, I’d be tempted to buy in, with a limited investment, to capitalize on the upside surprise expected in July 2019. I’d adhere to the age-old, tried-and-true market aphorism of taking my profits early and often, based upon the headwinds of the macro economy. I would also employ a Capture Gains mentality over the Stop-Loss (losing) game plan. And I wouldn’t bet the farm. As the landscape changes rapidly, time proven systems will be your ally. Join me at my Colorado Investor Edu Retreat, where we’ll examine how to protect your assets, learn what's safe in a world where stocks and bonds are in a bubble and invest profitably in high growth opportunities (like cannabis). Call 310-430-2397 or email info @ NataliePace.com to learn more about the retreat, or to request an unbiased second opinion on your current budgeting and investing plan! Why Did Wells Fargo’s CEO Get the Boot? On March 28, 2019, Wells Fargo announced that their CEO Timothy Sloan had resigned on March 26, 2019 effective immediately. The board has elected an interim CEO and president (C. Allen Parker) to take his place for now. Mr. Sloan will retire from the company on June 30, 2019. Just like that, Sloan has been erased from the website. If you click on the link to his bio, it actually redirects to Parker. The abrupt departure of any CEO at the end of the quarter (and just a few weeks before the 1Q earnings report is released) is a massive red flag. Succession plans usually allow generously for a transition period. Immediate departures are alarming. Add in the fact that Sloan was Wells Fargo’s CFO and COO prior to being named the CEO and you’ve got a neon sign brighter than the Vegas Strip. The fake account scandal revealed a corrupt corporate culture. However, instead of bringing in new blood, Wells Fargo actually promoted the executive (Sloan) who most bragged about all of the new accounts on earnings calls to investors during the height of the scandal. So, why the rush for “fresh perspectives” now? All signs point to problems with Wells Fargo’s first quarter earnings report. All of the banks, including Wells, have been issuing new debt over the last few months. Could this be to beef up their cash positions to buffer against the rough tides of an inverted yield curve? Will earnings be negatively impacted now that the loans banks offer pays them less than their own borrowing rate? Over the past few years, many banks have been on a field day, reporting solid earnings growth and outstanding profit margins. In the last quarter, Wells Fargo’s revenue was only down 4.09% (for obvious reasons), while their profit margins were a solid 24.37%. Goldman Sachs, Bank of America and Citigroup all reported revenue increases of 14.0%-18.5% year over year, with profit margins in the 19%-31% range. However, the yield curve inverted on March 20th, and has been flat throughout the first quarter of 2019. That will have a very negative on bank revenue and income. The inverted yield curve is also 100% correlated with recessions for the past half century. Will Wells Fargo Post A Terrible Earnings Report? The departure of a CFO turned CEO, at the end of a quarter that we already know is going to be squeezed (GDP is predicted to drop under 2.0% in the 1st quarter of 2019), is never a good sign for earnings. We won’t know how bad Sloan’s earnings report card really is until Friday, April 12, 2019 at 8 am ET. However, this abrupt event is definitely inauspicious for Well’s Fargo’s 1st quarter 2019 earnings report. 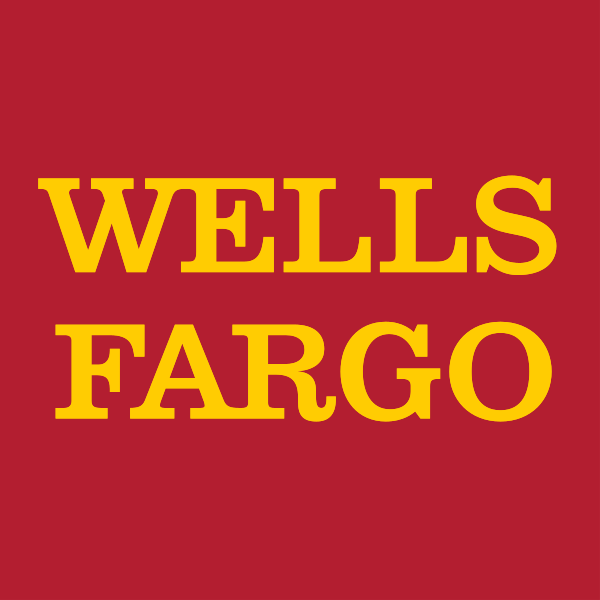 Wells Fargo repurchased 375.5 million shares of their own stock in 2018, for around $21 billion (source: S&P Dow Jones Indices). That was more than double the amount that the company spent on share repurchases in 2017. Clearly the company plan under Sloan was to keep their share price afloat with their own buybacks. In 2019, it may be more difficult to continue at that aggressive pace. With $9.5 billion given out in dividends and $21 billion in share repurchases in 2018, Wells Fargo’s “return to investors” of $30.5 billion was higher than the company’s net income of $22.4 billion. General Electric was slammed for that policy, once investors learned of it (after the company slashed their dividend and the share price imploded by 2/3rds). Again, we’ll know more about how all of this impacts Wells Fargo’s earnings on April 12, 2019. Before then, it’s a good idea to double-check your own holdings and funds to make sure that you are not over-exposed to this beleaguered bank. 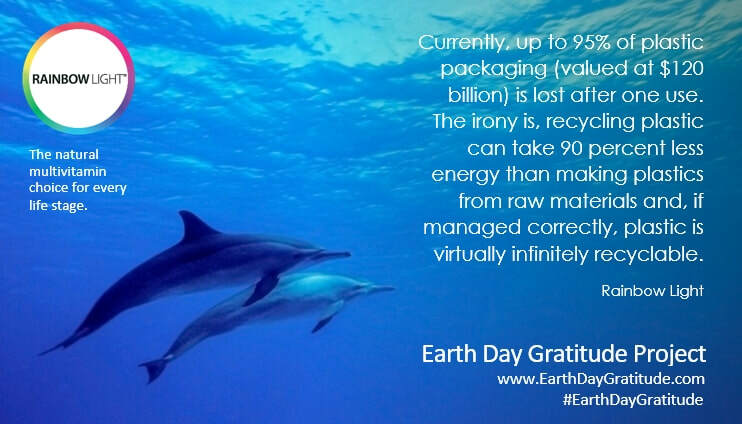 Earth Gratitude on Earth Day. Free Teleconferences This Week. ​Are you alarmed by the reports of global warming, of sea levels rising, of islands disappearing, of an island of plastic floating in the ocean, of the predictions that, at the current rate, there will be more plastic in the ocean than fish in just a few short decades? * We already have our first climate refugees (from Louisiana). * On sunny days during high tides, fish and seawater flood the streets in Miami. * The mighty Colorado River has dried up 50 miles short of the ocean? * 62% of the U.S. electric grid is still powered with fossil fuels? Global warming isn't something we have to worry about tomorrow. It's here now. 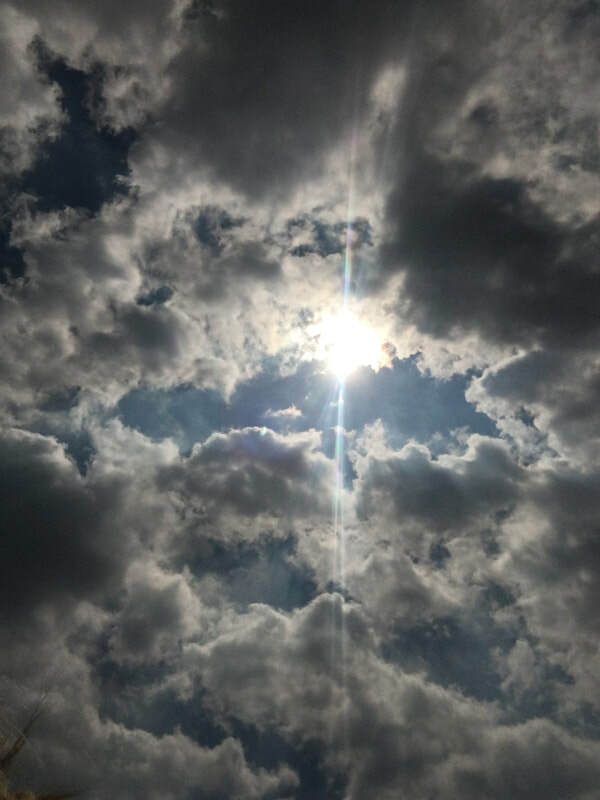 There are quite a lot of things that everyday folks can do to breathe cleaner air, preserve their fresh water, reduce their plastic usage and promote a healthy planet. 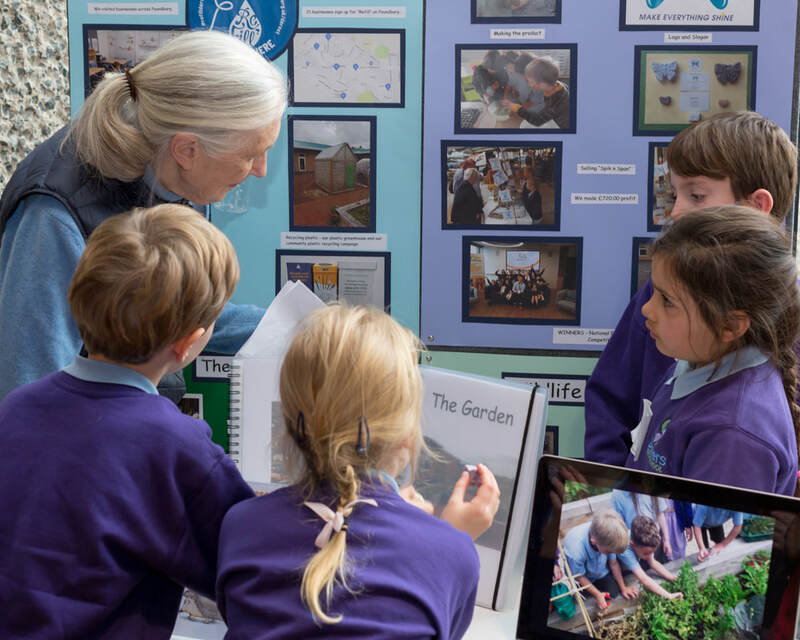 I was so impressed with the 4-9 year olds at Damers First School in Poundbury, England, and their outstanding teacher Edd Moore, that I proclaimed them to be England's most powerful green lobby, on my ThriveGlobal blog. (See the picture of Queen Elizabeth visiting with the children below.) The Damers School students are showing how bad habits can be replaced overnight, so that each one of us can "be the change we wish to see." 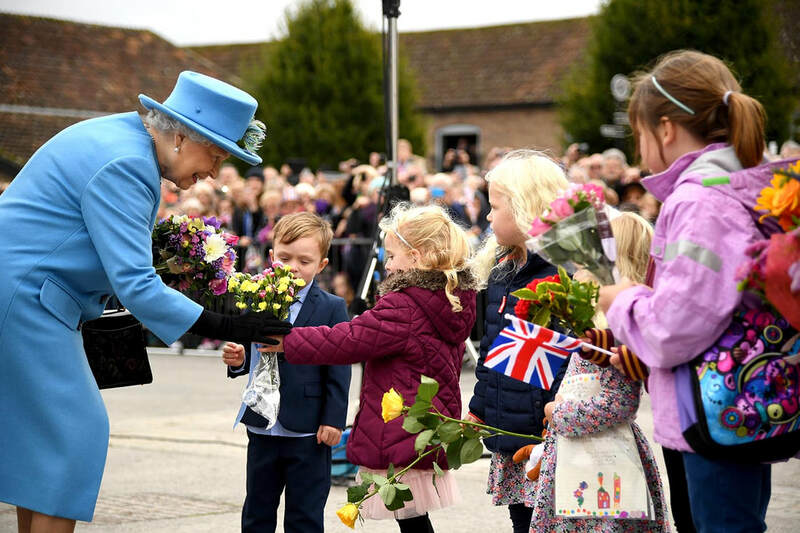 Queen Elizabeth II with the children of Damers First School (Poundbury, England). Jane Goodall with the children of Damers First School (Poundbury, England). On Wednesday, April 3, 2019, at noon ET (9 am PT), I will interview Edd Moore and a few of the Damers School children for their tips on how we as individuals can inspire our town, county and even country to eliminate plastic, reduce our fossil fuel usage and eat healthier. 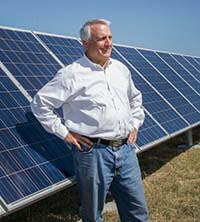 The following day, on Thursday April 4, 2019 at noon ET, Governor Bill Ritter, Colorado’s 41st governor and a director at the Colorado State University Center for a New Energy Economy, will enlighten us on technological developments in clean energy and steps each one of us can take toward a fossil-free future. You can call into both teleconferences at: 347.215.7305. Listen back links for both teleconferences are at BlogTalkRadio.com/NataliePace. Bill Ritter, the 41st governor of Colorado. (c) 2016. Marie Commiskey. Avalon Photography. Used with permission. 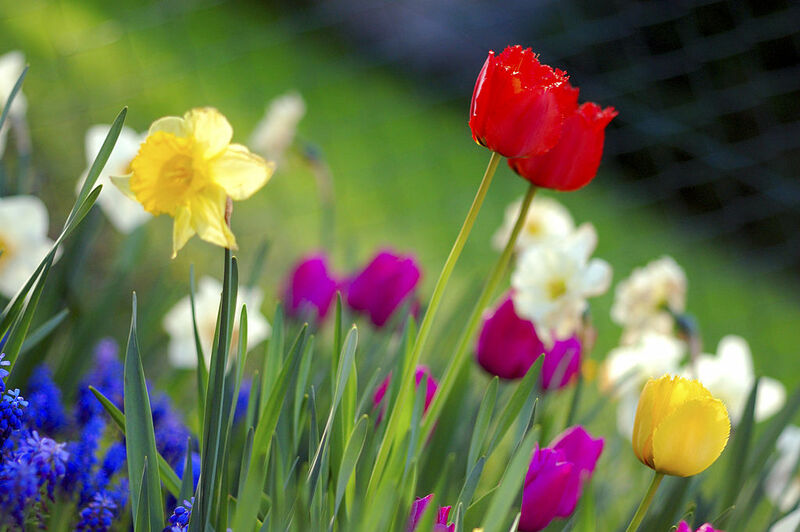 If you are in Colorado for Easter, join me in Loveland on April 18, 2019 for a Put Your Money Where Your Heart Is conference, hosted by the New Thought Northern Colorado Center for Spiritual Living. There we will play the Billionaire Game and learn how to put your money where your heart is and profit, while creating the world of tomorrow, for our children. Call 310-430-2397 or email info@NataliePace.com to learn more. 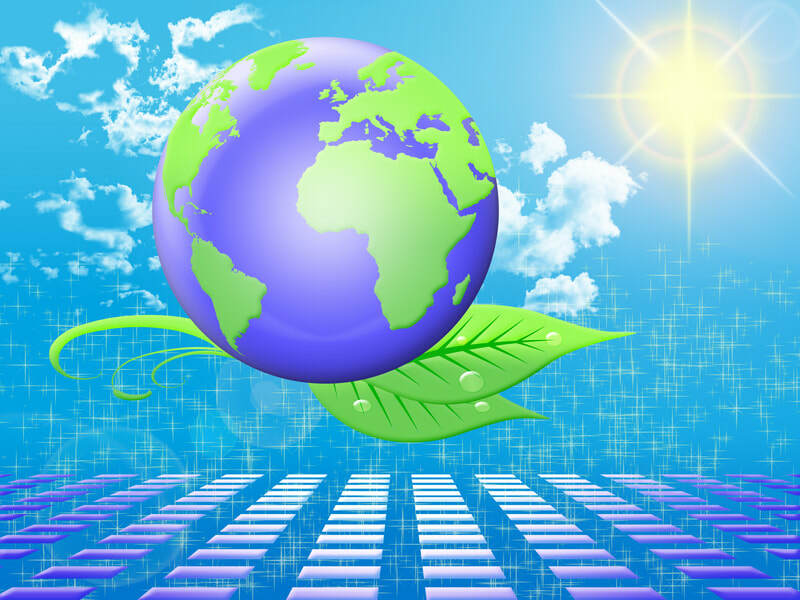 On April 22nd, Earth Day, we're encouraging everyone to power up the gratitude and power down the pollution, getting as close to personal net zero as possible for at least one hour. 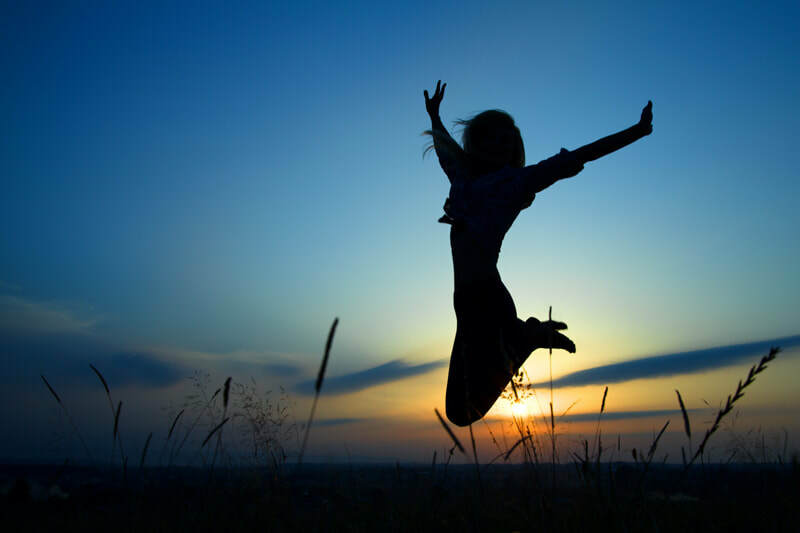 What kind of celebration can you create that is both fun and life-transformational? Be epic. Observe the fresh insights that flood our awareness and the world consciousness. Challenge your friends. Organize an awesome community net zero event. 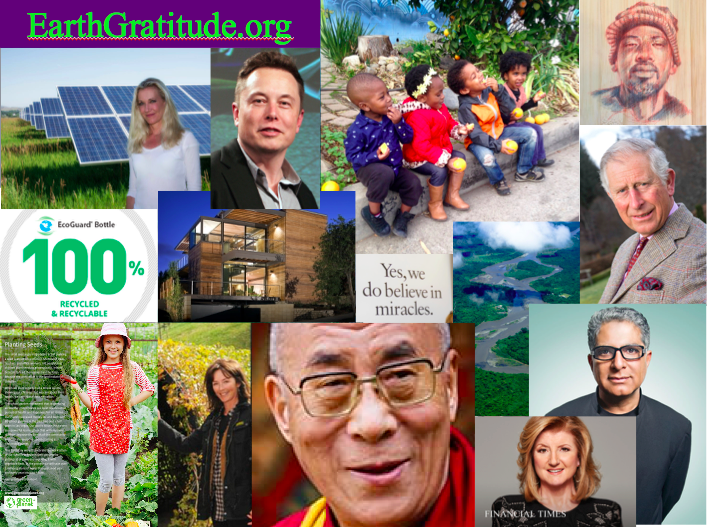 Include the hash tag #EarthGratitude when you share your pictures and video, so that we can like and reshare. 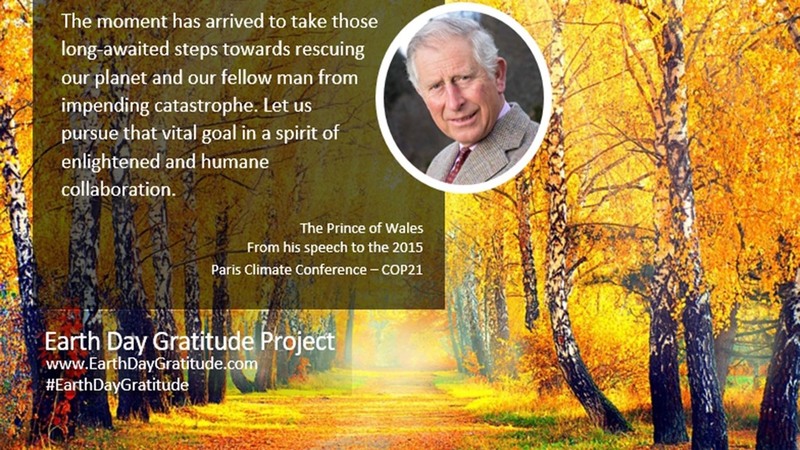 Get additional information about the Earth Gratitude project at http://earthgratitude.org/. There you can download two free picturesque ebooks full of important information on sustainability, Clean Living and Future Earth. Share freely with your friends. Additional Information about my work in financial literacy, sustainability and personal empowerment can be found on my bio. I'm very interested in learning what you are doing to celebrate and honor Mother Earth this April 22nd. 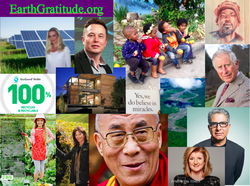 Please use the #EarthGratitude, so that I can find your video & photos easily. Thanks! Real Estate is Back to An All-Time High. Is it 2008 All Over Again? ​Buying real estate between 2005 and 2007 was a nightmare. Over 10 million homes were lost in the wake of the Great Recession. If you purchased a home in the years preceding 2008, or refinanced at or above the value of your home, the last decade was a living nightmare. Conversely, the low for real estate was in 2011. If you purchased a home then, you’re up at least by 53% (nationwide). Cities like Las Vegas, Denver, San Francisco and even Detroit have seen home values double or more. Seattle prices have skyrocketed by 76%. You’re riding high and living the Life of Riley! There is no denying that when you purchase an investment can be the most formidable foe, or your best ally. In February of 2011, a young entrepreneur in his mid-30s attended my Investor Educational Retreat. At that time, real estate was a bargain. He was earning a good, steady income, and had a young family. He lived in Las Vegas, where real estate prices had plummeted. AT could purchase a home and live in it for much less than he was spending on rent. Plus he could write off the mortgage interest to reduce his taxable income and save a boatload on taxes each year. AT was just starting out with his nest egg, and wanted tips to diversify it and get it going. He wasn’t even thinking of purchasing a home. However, I said that the lowest-hanging fruit for him was to purchase a home first, and then start building up the nest egg. He did. His home value doubled by 2017, at which time he sold, took his profits and made a dramatic move to British Columbia, where he built his own off-grid sustainable home, where he lives with his wife and young son. He has traded in the stress of commuting in Vegas for the challenges of living in the wilderness. However, having the funds to create his new life began by making an outstanding home purchase in 2011. Another example of subprime hell came in the form of a successful young woman, BB, who was at her wit’s end when she came to my Investor Educational Retreat in January of 2008. Her boyfriend’s friend had suckered her into buying a condo in Florida in 2007. This realtor “friend” promised to flip it within a few short months and give her back a quick and easy $20,000-$40,000. After months of paying high mortgage and Homeowner Association fees, while watching the value of her purchase plummet, she reached out to me in desperation for some private coaching. I found a legal colleague who was able to assist her in getting a deed in lieu (giving the keys back to the bank). When you make a grave investment mistake that is likely to decrease dramatically in value, the sooner you accept this and get out of it, the better off you’ll be. BB’s credit score recovered rather quickly (before most people even got out of their subprime hell). She also saved herself several years of hell and hundreds of thousands of dollars by getting out early. She’s now a proud homeowner and the mother of a young son (rather than the desperate servant of an underwater condo) and in a loving relationship (with a different life partner). Most real estate seminars offer you very basic tips on how to secure a loan. They tout up the value of owning income-property (which is real) – without having a time-proven system on how to make sure your investment is a rewarding, dream-come-true “money while you sleep” experience, instead of a nightmare that can dog you for decades (which is always a potential reality with a big purchase like real estate). Trump University wasn’t the only ruse that suckered people into investing tens of thousands of dollars for inexperienced mentors offering unsound strategies. This space is still full of marketers who pose as good investors, with enticing language and exciting offers (even free seminars! ), who whitewash over the Great Recession as if it never existed. If you take the bait, you’ll then be sold into expensive mentoring and software. However, that’s not the only cost of that free real estate seminar. If you buy high in real estate, you don’t just lose your investment. You could be on the hook for hundreds of thousands of dollars of lost equity, if the value of your property falls beneath the amount of your loan. You’ll be stuck with it, unable to sell it. And if you are able to short sell it, then you could be stuck with a very high tax bill on the “phantom income” of the difference between the sale price and your loan. Again, one of the most important considerations for buying real estate is the price itself. Real estate prices are back to an all-time high. So, now is the time when most of these real estate mentors will be revealed as self-serving marketers rather than masters. It’s important you learn that lesson in the wings, rather than on your own dime. Low interest rates create asset bubbles. As you can see in the chart below, asset prices (stocks and real estate) are back to all-time highs. Debt is now astronomical. The statistics that politicians use to claim a strong economy, low unemployment and inflation, are not indicators of where the economy is headed. In fact, since 2000, asset bubbles have been the reliable harbingers of recessions. Real estate prices plummeted during the Great Recession, with many markets dropping to less than half their value at the high. It’s a warning worth heading today. With real estate prices back to an all-time high, what’s your best game plan? 1. Learn how to implement the 3-Ingredient Recipe for Cooking Up Profits for your real estate investment. Do your research and planning now, so that you’ll be ready to make a purchase when prices become more favorable. There are many events that create buying opportunities, including bubbles popping, deflation, unaffordability, the labor market slackening, natural disasters, terrorist events, the 4 D’s (death, depression, divorce and disaster) and more. 1. Start With What You Know and Love. 3. Buy Low; Sell High. 2. There is also more shadow inventory than most professionals are aware of. So, it will really pay to know the market you wish to buy into, and understanding how many people are hanging onto property they cannot afford by a thread. 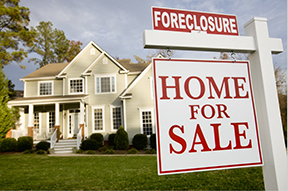 Any local market with a judicial foreclosure process is likely to have a lot more shadow inventory. Did you know that there are still more than five million U.S. homes that are severely underwater – owing at least 25% more than their value (source: AttomData.com)? 3. You will also do well with thinking bigger, and considering innovative solutions to pervasive problems, such as affordable housing, which is needed in most major cities in the developed world. You can listen to my complete interview with Lawrence Yun on my BlogTalkRadio.com/NataliePace pod cast. ​Today, many asset bubbles are at an all-time high. You can’t afford to get bad advice. That is why I’m offering the Real Estate Master Class this April 26, 2019 in Denver, Colorado. Call 310-430-2397 or email info @ NataliePace.com to learn more and register now. Today, the Dow Jones Industrial Average dropped 460 points, marking the worst day-drop since the 660-point drop on January 3, 2019. And both of these plummets were preceded by the worst December since the Great Depression. Is the Spring Rally over? The good news is that the recent tax cuts sparked 2018 to the fastest economic growth the U.S. has seen since 2006, at 2.9% and 3.3%, respectively. The bad news is that wasn’t matched with spending cuts, so the public debt is higher than its ever been – at $22 trillion. On Wednesday, the Federal Reserve Board indicated there will be no interest rate hikes this year, and that they will stop deleveraging their own balance sheet at the end of this September. That seems like good news on the surface, particularly for interest-rate sensitive industries, like housing, and leveraged corporations that need to borrow money. However, since two of the primary economic concerns are overleverage (too much debt) and pricey valuations (bubbles), and since low interest rates contribute to bubbles and borrowing, continuing an accommodative stance risks exacerbating those two problems. Alan Greenspan, Warren Buffett, Robert Shiller and many other economists have all gone on record saying that stocks and bonds are in a bubble. Click to read through 12 Economic Concerns outlined in the Financial Stability Report that was released on November 28, 2018. 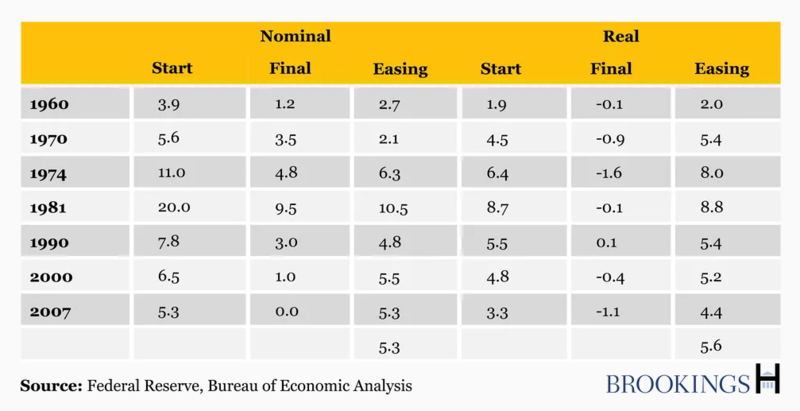 Also, having the Fed Fund Rate at just 2.25-2.50% doesn’t give the Federal Reserve much room to lower rates, and goose the economy, when things head south. The most recent GDP growth projections are for 2.1% growth in 2019 and 1.9% in 2020 – much lower than 2018’s 2.9% – which is why the Federal Reserve is pausing on their interest rate hikes. The 1st quarter 2019 GDP growth is predicted to be downright dismal – at 1.2-1.3%. What Does All of This Mean for the Spring Rally 2019? After the worst December (2018) on Wall Street since the Great Depression (1931) -9.13 and -14.53% in the S&P500 respectively, Wall Street came roaring back. The Dow Jones Industrial Average is up 10.5% since the beginning of the year. ​Can the rally continue? Should you lean into the returns assuming there will be more wind at your back? Or is it time to take cover into a defensive position, and do a full assessment of the level of risk in your current plan? * How well do March, April and May perform, when January and February are strong? * Do they continue the trend or give back some of the gains? * Is the pre-election year a rocket booster or a headwind on the Spring Rally? And here’s what the 10-Year Data revealed. * Most of the time when January and February are strong, the Spring Rally (including May) is weak. * The average gains for the first five months of the year are 4.3%. * The years with the strongest starts had the weakest growth, while the years with the stronger growth had negative (2010) or low performance (2015) in the first five months. * The pre-election year is usually great for the Spring Rally. 2007 gained 7.9% in the 1st five months of the year, while 2011 saw a solid 7% jump over that same period. In 2015, however, returns were tepid, at 2.4%. 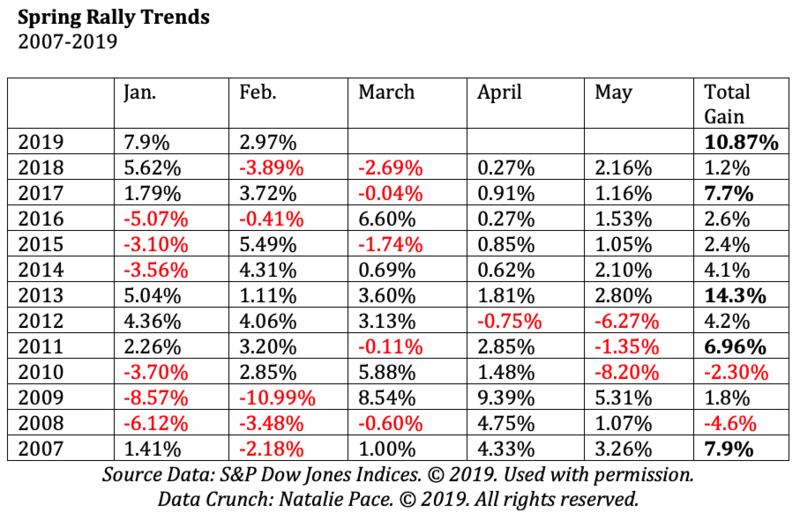 10.5% gains (January 1, 2019 – March 21, 2019) is much higher than the average performance. There was only one year, in 2013 with 14.3% gains during the first five months of the year. So, historical performance trends would suggest a weak Spring Rally, giving back some of the gains of January and February. Pre-election trends are not as reliable today as they were in the past. The 10-year average is a loss of -0.37%, while the 20-year average is 15.58% gains. Another interesting point is that two of the strongest 5-month starts on Wall Street, in 2013 and 2011, came with forward projections of an improving economy. 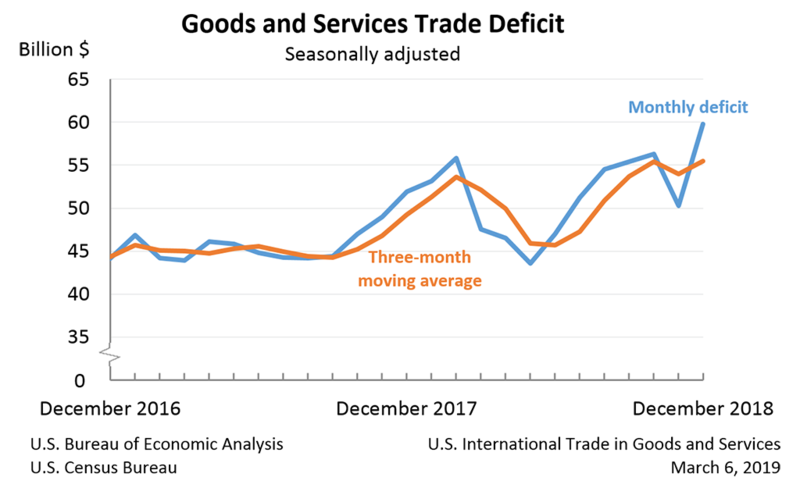 The recent projections were revised downward to a very slow growth of 2.1% growth in 2019. Wall Street veterans are always forward-thinking. So, today’s sell-off isn’t surprising. On April 26, 2019, we’ll get the advance numbers for GDP growth in the first quarter of this year. Economists are projecting growth between 0.4% and 1.4%. That is significantly lower than the 4th quarter 2018 growth of 2.6%. Investors typically don’t respond well to such a sharp slowdown. The yield curve just inverted today, with the 10-year treasury falling .03 percentage points below the 3-month treasury yield of 2.46%. An inverted yield curve is 100% correlated with recessions over the past half a century. Bloomberg reported on March 20, 2019 that corporations had ceased buying back their own stock – a key driver of this entire bull market – and would stay on the sidelines throughout the 5-week quiet period before earnings announcements – through mid-April. As you can see from the below chart of buybacks, corporations purchasing their own stock is a perfect mirror of Wall Street performance. Purchases were at a high when Wall Street spiked in October. Both hit the pits at the end of December, only to rally strong through the first two months of 2019. Corporate buybacks are clearly driving Wall Street’s performance. In short, there are far more red flags than green lights on Wall Street for the Spring Rally. December 2018 reminds us that when the winds change, losses can cut like a falling knife. The right answer is never all in or all out, but is, rather, a diversified plan that keeps enough safe, underweights the overleveraged companies and adds in performance. A well-diversified plan that is annually rebalanced forces you to do what you must do for successful investing in today’s world – buy low and sell high on auto-pilot in your nest egg. The days of Buy and Hope paying off ended in 1999. 2018 was a year when stocks and bonds lost money, which means that 2019 is the year that you need to know what you own, know what a healthier plan looks like and take charge – being the boss of your money. 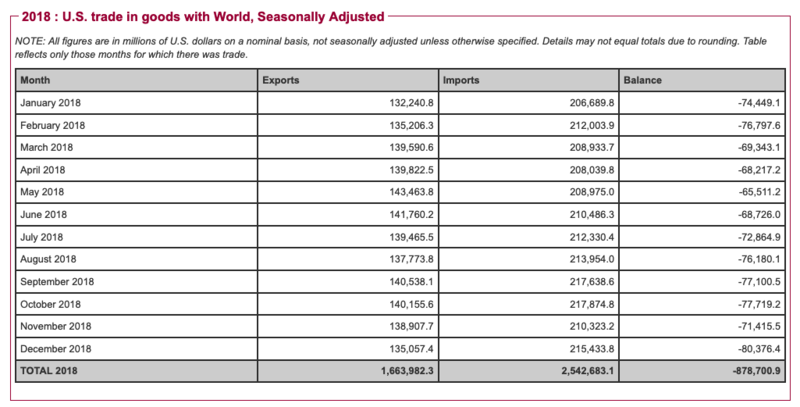 There is an $879 billion U.S. trade deficit (2018 FY). $22 trillion U.S. public debt (as of 3.22.19). The Debt Ceiling was hit 3.1.19. X date should land in Aug/Sept/Oct. 1Q 2019 GDP will be released on April 26, 2019. It is predicted to be 0.4% - 1.5%. The Feds have paused on rate hikes, and will stop balance sheet deleveraging at the end of September. Consumer and fixed income spending are softening. U.S. GDP is $20.9 trillion, while Debt is $22 trillion. The Lyft IPO. Should You Catch a Ride? 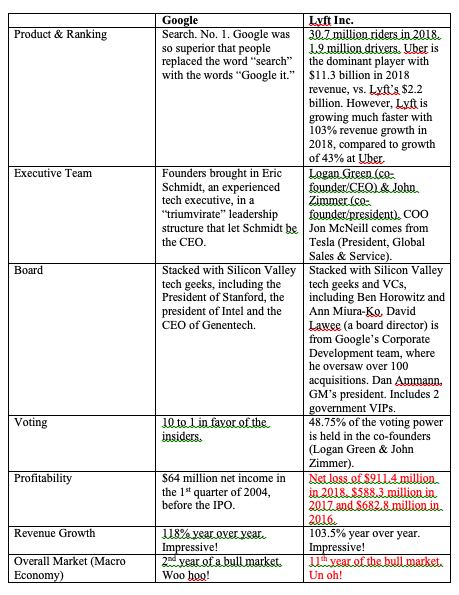 To put the LYFT IPO into better perspective, I lined up some of the key metrics alongside another highly anticipated IPO of yesteryear, Google. Google went on to become an $826 billion company (now called Alphabet Inc.). Can Lyft support a market value of $18.5 billion? Should you invest once it hits the big boards, which is expected to be as early as next week? The problems with the IPO relate solely to profitability and the macro economy. 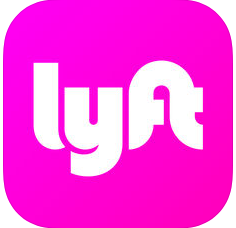 Lyft has been cash negative for three years now, with losses of almost a billion in 2018 ($911.4 million). We’ve gotten accustomed to companies losing a lot of money or carrying a very high price-to-earnings ratio. This is largely because it is very cheap for businesses to borrow money. Banks are willing to take on a lot of risk to keeping loaning companies money, so that they can rack up the fees for their own quarterly earnings. However, with an economy that is expected to slow down to 0.4-1.4% in the 1st quarter of 2019, pricey valuations can be very risky. When investors get skittish about valuation, even companies that are experiencing great growth and enormous market share can lose a lot of value very rapidly. ​It’s possible that the hype and potential of Lyft could lift the share price up next week when it begins trading. However, a tepid 1st quarter GDP report on April 26, 2019, which many fund managers are expecting now, could also make any lift short-term. The macro economy sobered up the valuations of other rock star companies like Netflix and Nvidia in December 2018, and it is very possible that it could do the same with Lyft in late April. Lyft is a great company that is disrupting old-school transportation. The trends, revenue growth and leadership team are all in the company’s favor. However, the macro economy winds are in the company’s face. As the landscape changes rapidly, time proven systems will be your ally. Join me at my Colorado Investor Edu Retreat, where we’ll examine how to invest profitably in Lyft, cannabis, and many more high growth opportunities in far greater detail. Call 310-430-2397 or email info @ NataliePace.com to learn more! Real Estate Master Class. April 26, 2019. Receive $100 off the price of the Master Class when you register for the Colorado Investor Educational Retreat, too. Call 310-430-2397 or email info @ NataliePace.com to learn more.